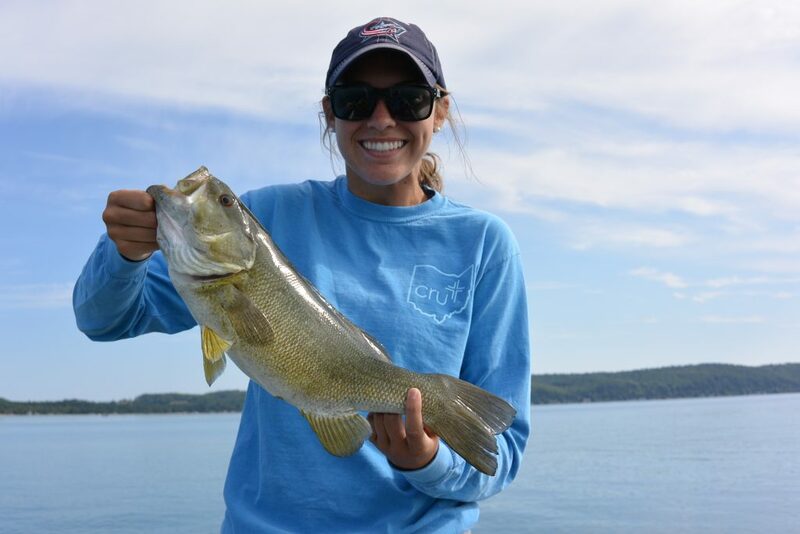 Sport Fish Michigan has had terrific fishing this summer; water temperatures have gradually increased providing a consistent bite for most big water species. 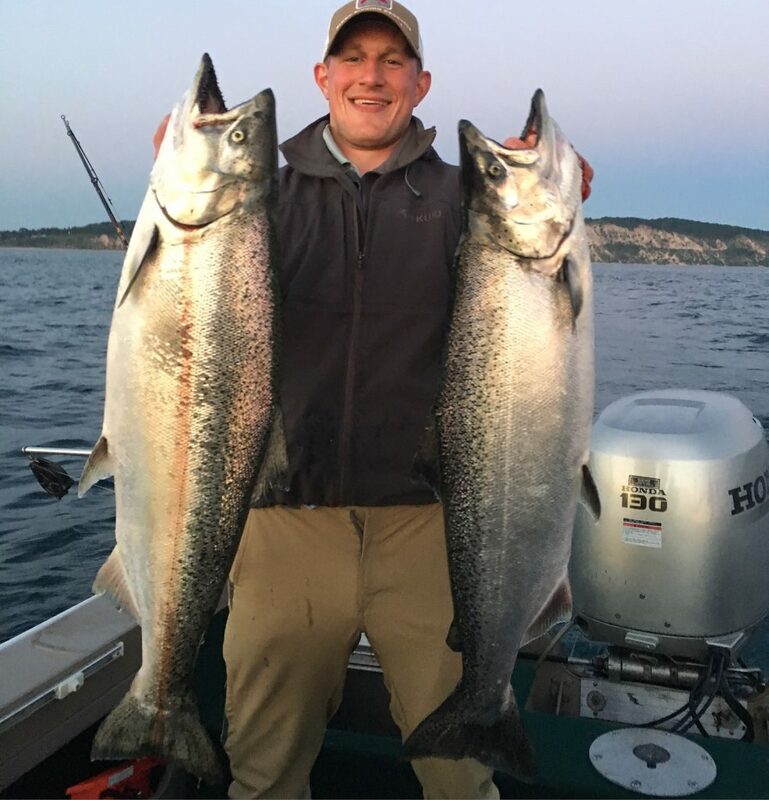 August is a great month for anglers to target some very willing trout and salmon in the Northwest region of Lake Michigan. Grand Traverse Bay is fishing very well this August. Water temperatures have been varying with wind direction from 68-70 degrees on the surface. Anglers that have successfully found the thermocline have been producing good catches of Lake Trout in 80-100 feet of water. Jigging and trolling have produced good catches of trout. Ciscos have been feeding above the thermocline attacking higher in the water column. Both east and west bay have been blessed with a fairly high density of alewife over the course of the spring and summer. This has provided a fishable salmon population for anglers willing to troll. Most of the salmon being caught have been 2-3 years old with the occasional adult encounter. Flasher and fly combinations, lead core, spoons, and even cut bait rigs have been productive. Platte Bay is setting up very nicely for this fall. With the warm temperatures in August, the thermocline will be found 80-100 feet depending on the wind direction. This provides an excellent depth range to target aggressive lake trout that have been biting very well all spring and summer. Larger dodgers, cowbells, and small spoons trolled at 1.9-2.4 mph have been best for most anglers. Pockets of baitfish have been found near and around the rocks and steep breaks. Frankfort has offered some spectacular fishing all spring and summer. Warm August temperatures have brought heavy south winds forcing most of the fish deep with the thermocline ranging from 80-120 feet. Lake trout fishing has been very consistent with most schools of fish gathering along the steep breaks and under water points. 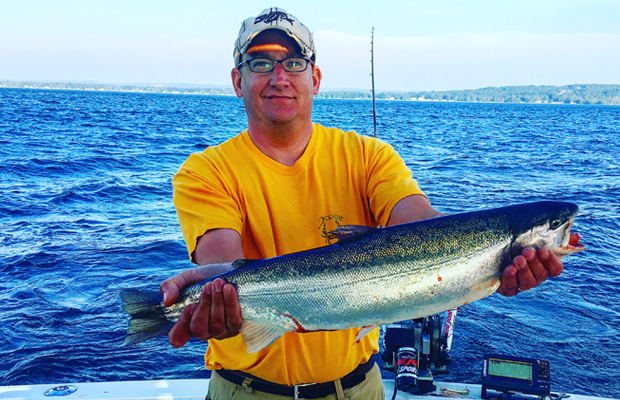 Anglers that have fully committed to salmon fishing have been producing some nice fish. Salmon numbers have fluctuated with the wind direction; however most anglers are reporting a very fishable population. Summer time bass fishing in and around the Traverse City area is in full swing now that we are in August, and that means fishing deeper water. With the incredible amount of wind that we experienced in July, the water temperatures aren’t super hot, which is helpful in keeping oxygenated water and fish active. 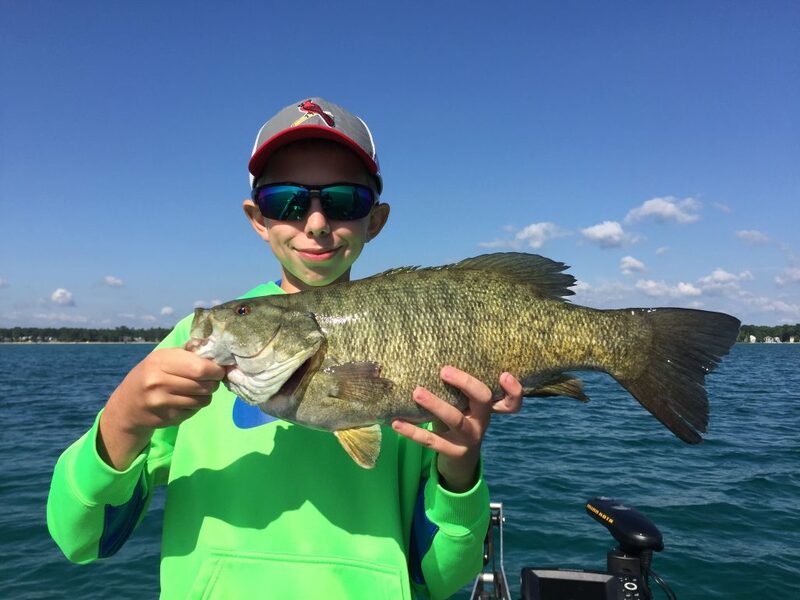 For those fishing on Grand Traverse Bays, the smallmouth fishing has been excellent at times, and spotty at times. For the most part, anglers should target deep structure in 20 feet or more. A good sonar graph will help to pinpoint these structures. Deep weed beds will also hold fish, as this is where baitfish, crayfish and bugs will all congregate. Drop shots are a staple for us here at Sport Fish Michigan and Traverse City Bass Guide Service. When there is wind, a spinner bait fished on the shallower flats can lead to some thunderous bites! For the early-morning risers, a top water fished early in the day or late in the evening can be a great way to target fish orienting on the shallow side of deep drop-offs. For inland waters, the bass are relating to deeper water that also have weed edges associated with them. Top waters are a great way to locate fish early in the day, or again later in the evening, although smallmouth will readily bite top waters all day if there are slick overcast conditions. A soft plastic jerk bait can be another fantastic option this time of year. While the bass fishing may be in its summer patterns, the opportunities to have a great day on the water still abound. With lots of summer boating traffic to contend with, make sure to have the necessary safety equipment onboard. Have lots of fun, and just as important is to stay safe!